PR SOLES are specifically designed for runners to provide the most comfortable footwear for before or after a run to promote recovery of sore and tired feet. Just step into these super comfortable flip flops featuring ACUPOINT soles to have your feet massaged as you walk. 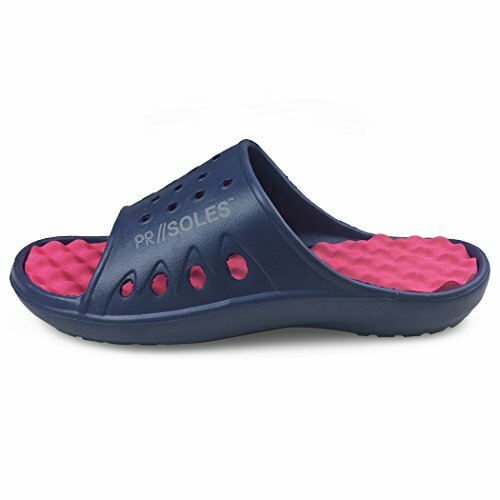 PR SOLES are lightweight, breathable, waterproof and feature our unique foam cushioned ACUPOINT soles for ultimate massaging comfort that both refresh and energize your feet. How Do PR SOLES Work? The unique raised triggers on the ACUPOINT soles activate nerve endings in the feet that send healing relief through the entire body. These triggers are specially designed to massage your feet improving circulation and breaking up painful lactic acid and uric acid that accumulate in the feet after a run or any extended time on your feet. Recover Faster and Smarter By slipping on PR SOLES after a run or activity, the triggers will immediately engage your feet to increase circulation and nerve stimulation which benefits the entire body. Here are just a few of the benefits of applying massaging action to the feet: 1. Improves circulation by stimulating blood flow, which will refresh the feet and legs. 2. Breaks up accumulated wastes such as lactic and uric acid in the feet. 3. Alleviates foot, leg and lower back pain. 4. Reduces swelling and tension. 5. Stimulates nerve endings benefiting the entire body. 6. Feet and legs recover faster. First Use When wearing PR SOLES for the first time, some people may experience slight "ouchies" from the massage trigger points. This is normal for some feet to initially feel a little sensitive. Your feet will adapt quickly and you will soon be saying "ahhh..."
RECOVER FASTER! PR SOLES are specifically designed to provide athletes the most comfortable pre and post workout footwear to promote the recovery of sore and tired feet. Also great for anyone who spends a lot of time on their feet. Significantly reduce your recovery time by wearing PR SOLES and make your body feel all around better. PAMPER YOUR FEET! PR SOLES are proven to alleviate foot, leg, and lower back pain by stimulating nerves and sending healing relief throughout your entire body! Designed with lightweight, breathable material, easily slip on PR SOLES after a long run, a hard day at work or just to lounge around the house to relieve tension and swelling of the feet for constant, all-day comfort. SIZING: Please refer to the size chart depicted in the product images. For the perfect fit, measure your feet prior to ordering and compare with our size chart!